I decided to read The Curse of the Good Girl by Rachel Simmons because I was worried about the dangers of “the ideal girl” curtailing my daughters’ power and potential. But what I quickly discovered is that one doesn’t need to have daughters to get something out of this title, as Simmons tackles the curse of the Good Mother and Good Wife as well. 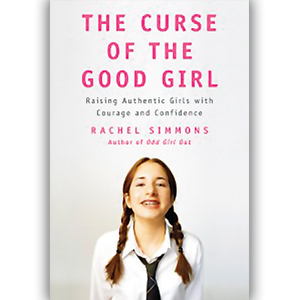 Ultimately, it not only gives practical strategies to help parents raise authentic girls with courage and confidence but it also offers thorough explanations as to why it’s important to erase the “nice girl” image from all women’s lives. According to Simmons, “The Curse of the Good Girl erects a psychological glass ceiling that begins its destructive sprawl in girlhood and extends across the female life span, stunting the growth of skills and habits essential to becoming a strong woman.” The problem is that while the Good Girl is socially and academically successful, Simmons explains, she represses what she thinks and is unable to handle her mistakes with humor. These behaviors present numerous issues in the long term. “There is nothing wrong with being a nice person,” Simmons maintains, “But girls need to have the tools to say no, to ask for what they need, and to say what they think.” Otherwise, they will forever hide their feelings in favor of keeping the peace and as a result never learn how to engage in emotionally honest conversations. This kind of language is problematic because if girls can’t speak the truth then chances are they won’t seek out the truth either. This inability to pursue the answers to their questions forces girls to draw conclusions from what Simmons calls “dubious evidence: an unreturned wave, an ambiguous facial gesture, or a coy remark.” Using assumptions, like these, to steer their relationships prevents girls from fully engage with other people. Furthermore, the Curse of the Good Girl creates a “peer culture where taking responsibility for mistakes indelibly marks your reputation and where the rules for social success are at odds with being honest,” explains Simmons. In other words, girls can’t admit to mistakes without it leading to the questioning of their self-worth. In the short term, it’s easier simply to deny their failings, but in the long term, the practice promotes shame because the girls have hidden so much of their true selves. As a result, Simmons believes, “What girls need is a careful balance between self-concept and the mistakes they will inevitably make.” Therefore, Simmons stocks the second half of her book with instructions on breaking the curse. So if you’re interested in finding out more about turning your Good Girl into a Real Girl, then I suggest checking out this great book.